Both men carry authority and business acumen; both take risks; both speak their mind and both court controversy as a marketing strategy. But it remains to be seen whether Donald Trump and Michael O’Leary have the wisdom to forge the appropriate culture to meet the needs of the next challenge. As we near the President Elect’s inauguration, those of us beyond the shock of the election results now hope (against hope) that the tactics employed to gain the office will change to execute the office. The problem with slim majority victories is inheriting a divided landscape. Much has been said about America as a divided nation, and Trump’s campaign was marked by exploiting that division: in versus out, us versus them. His litany of incendiary remarks was a tactical marketing strategy that positioned him amongst loyal voters seemingly concealed from the media’s watchful eye and polling data. Now, having won the presidency, his greatest challenge is to lead a fragmented people. A large part of his role (hopefully) will be using his position to bridge the gap and build trust: leadership evinced in healing and unifying a nation. Sacrificing the bombast would be a welcomed first step. 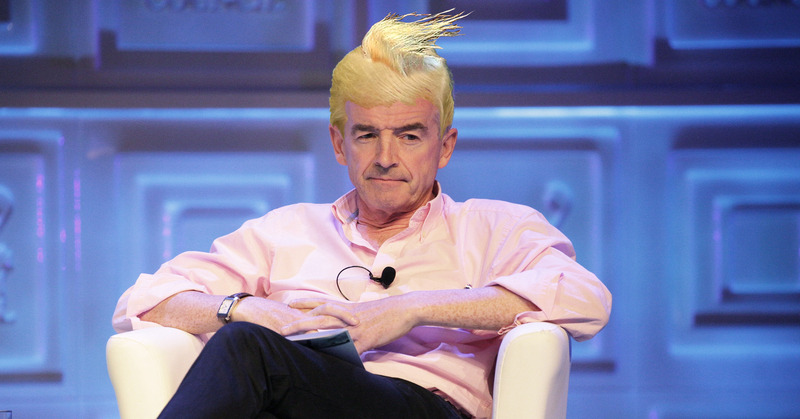 Similarly, Michael O’Leary has used coarse bravado and a touch of the outrageous to dominate news feeds and social media, and cast the short haul airline as the leading low cost carrier in Europe. A personal favourite of mine was in 2009 when he told the BBC that Ryanair were considering installing “a coin slot on the toilet door, so that people might actually have to spend a pound to spend a penny in future.” He continued to fuel the furore with, "I don't think there is anybody in history that has got on board a Ryanair aircraft with less than a pound." For the following week, the outcry of “Ryanair is Cheap” dominated headlines. It is the language of the people. What happens when you search for “cheap flights”? Inevitably, Ryanair is the result. The charge to use the toilet was never implemented and eight days later Michael O’Leary impudently remarked, “It is not likely to happen, but it makes for interesting and very cheap PR.” Undoubtedly, a stroke of marketing genius. The problem is once a company penetrates a market to become the recognised leader, the vision must broaden to accommodate new expectations. Conducting business like the cheeky underdog becomes disingenuous. This was no more evident than in 2013 when Ryanair were issued two profit warnings. People were willing to pay more to avoid flying with Ryanair. The people had voted with their wallets, and shareholders demanded change. Ryanair’s refusal to enculturate with a new breed of traveller was unbecoming of a leader of industry, certainly with a brand that now has aspirations of becoming the Amazon of Travel. The stark realisation of a brand that was failing to communicate with its customers precipitated the systematic deconstruction of a facade built around O’Leary’s machismo. 2014 saw the beginning of a marketing makeover and the launch of O’Leary 2.0 - the Michael O’Leary you would consider to mind your children. The new role of the Ryanair CEO might be characterised by bridging the gap between the brand and the traveller or the future traveller. With a vision to become the Amazon of Travel the bar has been raised for Ryanair, albeit the stakes are a little higher for America/Civilisation/Earth with Trump’s finger on the button. The analogy is clear, the challenges that face a leader are different from the challenges of becoming a leader. Can Ryanair truly transcend the personal brand of their CEO? All the signs point in that direction: website, app, social media, acquisition of a new fleet of planes. But taking the next mountain will require more than efficiency. It will require a fundamental shift in understanding what travel is for the next generation of traveller, and aligning the culture of the brand with their values. A year wiser, and the Donald Trump of the campaign trail is certainly the same man we see in the Oval Office today. SAD. And, all the goodwill of the Ryanair rebrand of 2014 dissipated with some vintage O'Leary strong-arming of his own pilots–even Kenny Jacobs' statement "I don't want our customers to love us" smacks of a young O'Leary (They grow-up so fast). When one reflects on the tweets, bans, red button, wall, anti-immigrant rhetoric and the current slump in travel to the US it's hard to make a case for anyone else being a greater influence in the industry of travel. Not to mention, the President himself, would baulk at any suggestion that someone else–especially some upstart CEO with less than half a billion to his name–could be considered an influence of his magnitude in any corner of industry while he (in fully fledged health) still draws breath. In short, Donald Trump is the Donald Trump of the Travel Industry.....and every other industry.